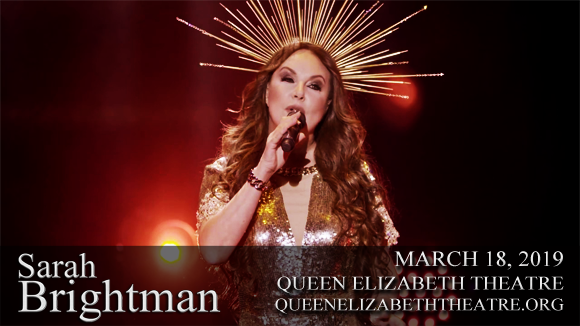 The world's best-selling soprano, Sarah Brightman, comes to Queen Elizabeth Theatre on Monday 18th March 2019 as part of her HYMN Tour! The pioneering artist and former Queen of Broadway and the West End embarks on her most ambitious and dazzling production yet with the HYMN Tour, delivering fans a captivating evening of entertainment from one of the world's greatest voices! Prepare to be utterly enchanted! English soprano singer, actress, musician, songwriter, conductor, and dancer Sarah Brightman is best known for her theatre work on Broadway and the West End, as well as her solo career as a classical crossover artist. She had her first taste of fame fronting the dance group Hot Gossip, who reached number six on the UK Singles Chart in 1978 with the hit "I Lost My Heart to a Starship Trooper". Brightman's West End debut came in 1981 in the Andrew Lloyd Webber production Cats: one of several Lloyd Webber musicals in which she starred throughout the 1980s. Her most famous role is that of Christine Daaé in The Phantom of the Opera – a role that she originated. Brightman's retirement from the stage came in 1990, when she re-entered the world of music working alongside former Enigma producer Frank Peterson, pioneering the classical crossover genre. She became a musical success once more and in 1996, Brightman released a duet with Italian tenor Andrea Bocelli, "Time to Say Goodbye", which is one of the best-selling singles of all time. To date, she has sold more than 30 million records and 2 million DVDs, and has achieved over 180 gold and platinum record awards in 38 different countries. HYMN, Brightman's fifteenth full-length album, was released in 2018.